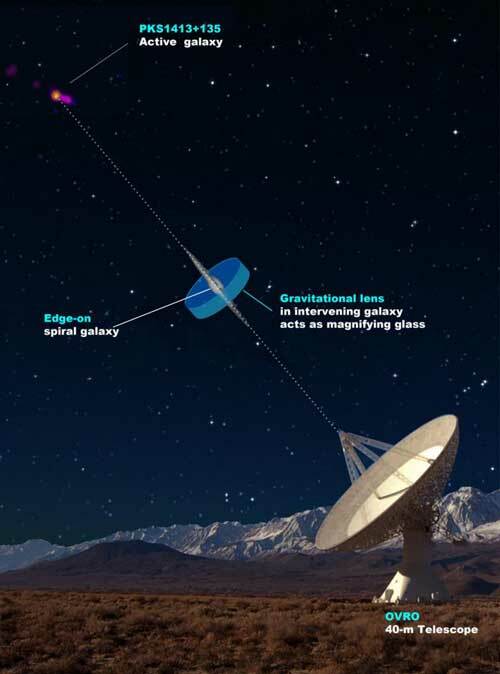 (Nanowerk News) Astronomers using Caltech's Owens Valley Radio Observatory (OVRO) have found evidence for a bizarre lensing system in space, in which a large assemblage of stars is magnifying a much more distant galaxy containing a jet-spewing supermassive black hole. The discovery provides the best view yet of blobs of hot gas that shoot out from supermassive black holes. Many supermassive black holes at the centers of galaxies blast out jets of gas traveling near the speed of light. The gravity of black holes pulls material toward them, but some of that material ends up ejected away from the black hole in jets. The jets are active for one to 10 million years--every few years, they spit out additional clumps of hot material. With the new gravitational lensing system, these clumps can be seen at scales about 100 times smaller than before. "The clumps we're seeing are very close to the central black hole and are tiny--only a few light-days across. We think these tiny components moving at close to the speed of light are being magnified by a gravitational lens in the foreground spiral galaxy," says Readhead. "This provides exquisite resolution of a millionth of a second of arc, which is equivalent to viewing a grain of salt on the moon from Earth." A critical element of this lensing system is the lens itself. The scientists think that this could be the first lens of intermediate mass--which means that it is bigger than previously observed "micro" lenses consisting of single stars and smaller than the well-studied massive lenses as big as galaxies. The lens described in the new paper, dubbed a "milli-lens," is thought to be about 10,000 solar masses, and most likely consists of a cluster of stars. An advantage of a milli-sized lens is that it is small enough not to block the entire source, which allows the jet clumps to be magnified and viewed as they travel, one by one, behind the lens. What's more, the researchers say the lens itself is of scientific interest because not much is known about objects of this intermediate-mass range.